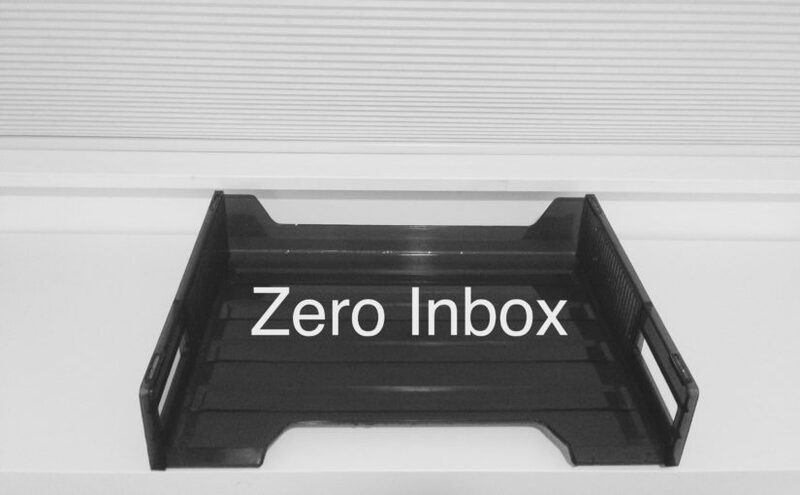 Achievement Unlocked: Zero Inbox…and You Can Too! Feel organized and on top of things for the first time in 3 years. Feel grateful for the relationships and events that happened in those years. Reconnect with old friends and acquaintances. Discover my deeper problem with sticking to any productivity system. Here’s how I did it and how you can too (just take 5 minutes to try out each step once as you’re reading this). 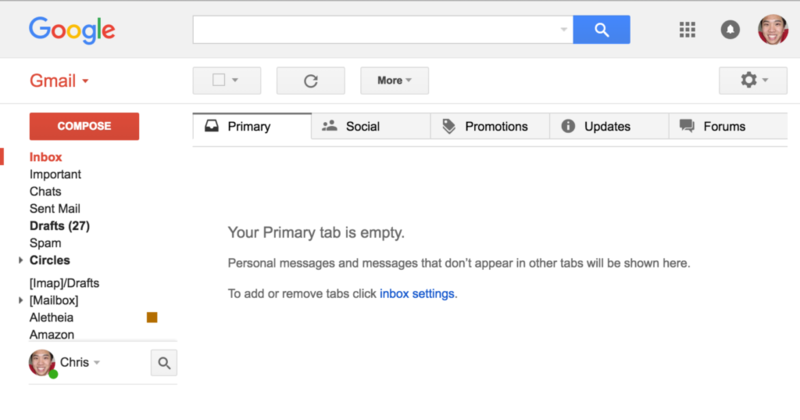 Note: While writing this post, I found out that the original Inbox Zero concept was created by Merlin Mann and presented at Google in 2007 in this talk. I use GMail, which has a helpful email counter that served as my scoreboard. The goal is to make it disappear (get it to zero). Delete all those old mailing list updates, promotional e-mails and other irrelevant messages that have been building up. If you enable keyboard shortcuts, you can use ‘k’ and ‘j’ to go up/down your messages and ‘x’ to select the ones you want to delete. Then press ‘#’ to delete. This will save your hand & wrist some mouse pain. Step 2: Label and archive. After skimming through your messages, you may notice some patterns emerging. Create a label to group content that you don’t need to take action on (e.g. messages you want to save for history or nostalgia), label those messages and archive them. Shortcut: Select a message(s), press ‘l’ to open the label menu, start typing the name of the label and press ‘enter’ (or “Create new” if it doesn’t exist yet). Then press ‘e’ to archive. Step 3: Reply and archive. Reply to any conversation you can push forward or resolve with a quick message. Then archive it (in case you didn’t know, the conversation comes back to your inbox when someone replies to you). If you go to settings, there is a “Send and Archive” button you can enable that makes this one-click. BIG WIN ====> Step 4: Create Tasks, link to the conversation(s) and archive. Your inbox is probably crowded with messages that remind you of things you need to do. Why not use a tool designed for the job like a to-do list instead? Go to your to-do list. Create a task for the message, then copy and paste a link to the email in the description (since Gmail doesn’t have a “share” button for the message, just copy the url in the address bar to get the link). Write a better title than the e-mail subject line so you know what really needs to be accomplished. Remember the details for the task. Have a quick link to take the next step on the task (e.g. reply to the message after you’ve made a decision). Combine multiple related conversations under a single task. Don’t forget to archive the message (shortcut: ‘e’) when you’re done. Kudos to my friend Elijah Elkins for this tip (copying a link to the e-mail in the task description) and his recommendation of the Plan app, which I’m starting to use to actually block out time on my calendar to complete tasks in my list. Step 5: Take notes and archive/delete. If you subscribe to any e-mail newsletters, e-mail courses or mailing lists there are probably a lot of messages you wanted to carefully read, but never got around to. For example, I had about 20 unread messages from the community building site Feverbee waiting for me. Open your note-taking app (I use Evernote) and work through those messages, writing down interesting insights along the way. If the e-mail is so substantial that it is worth saving, copy its link into the note and archive the e-mail. Otherwise, delete the message after you’ve gained the insight you wanted. Step 6: Pick off the stragglers and enjoy! 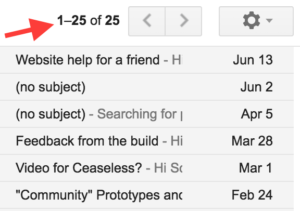 After a few passes through your inbox doing steps 1-6 you’ll probably still have a couple of stragglers. Pick them off one by one and gleefully watch your inbox counter go down to zero. The nice thing about these steps is that you can do them in any order and in multiple passes. Maybe one weekend you do a purge while going for a walk in the park. Next you read and take notes on your backlog of learning e-mails and the following day you finish converting all outstanding e-mails into tasks. All in all, it took me about 3 days of scattered time to knock my inbox down from ~2,000 to zero. Did these steps work for you? Share your experiences, struggles and tips with managing your inbox in the comments below! Next I plan to write about “Why productivity systems (even the one I just described) don’t seem to work for long”. 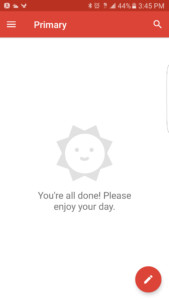 Posted on July 23, 2016 July 23, 2016 Tags productivity2 Comments on Achievement Unlocked: Zero Inbox…and You Can Too!